OK, so I'm a little bit late, but this is my Saturday post! It's also the final post about our recent vacation! We've been back for two weeks now and i find myself still trying to get bac into the swing of things! My last post included our stop in Skagway and then our scenic cruising in Tracy's Arm. 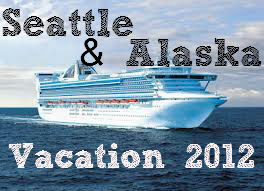 Check out that post here but don't forget to find the Seattle post and the first leg of our cruise! In Ketchikan we had a very sort amount of time, but had a Duck Tour scheduled and waiting for us! WE even saw salmon trying to swim upstream! Afterall, Ketchikan is the Salmon Capital of the World! They built a salmon ladder to help the fish fight the current. Becasue the current looks like this! Here we are ready to make our way down Creek Street but purely for tourist reasons. We then walked around and came across a rescue group that had this beauty on display! Then it was back on the ship and we headed to Victoria! We arrived the next evening and immediately got on a bus to head to the Butchart Gardens. Here we are on the bus on our way! And then some shots of the amazing garden that just had us floored and snapping off pictures like none other! And here is the same garden at night. Another spot in the garden that overlooks the water! The sunset and colors here were astonishing!It made me want a nice big talk glass of lemonade and a lounge chair! And then back to the ship, but not before getting a stamp in our passports and a quick shot with the Canadian flag! The next day we found ourselves back in Seattle and we headed back to Sea-Tac Airport! We had such a great time and really truly recommend the trip to Alaska! My husband and I feel so blessed to have gotten to experience this trip! What amazing creation there is to see! I hope you enjoyed a peek into our trip photos!